I have a bit of an odd relationship with Innis & Gunn‘s barrel-aged beers. Starting with the Scottish company’s flagship Innis & Gunn Original, I’ve thought that many of their brands are quite enjoyable sippers, a sentiment illustrated well by their remarkable success in my home province of Ontario. Some of their special editions, on the other hand, I have found quite awful, indeed almost unconscionably so considering the hefty price tag which came attached to them. One of those latter brews was last year’s Highland Cask, which I recall reviewing somewhere — I’m honestly unsure exactly where, or even if it was in print or electronic media — and finding to be a wee bit too similar to a Werther’s Original caramel candy. So I imagine it was with some trepidation that their p.r. people offered to send me samples of this year’s edition of the same beer, although to their credit that is exactly what they did. Ever willing to give a beer a second chance, I accepted. The casks are different for this beer, of course, although beyond “a famous distillery in the Highlands of Scotland,” we are told nothing of their origin. (And wouldn’t it impress the hell out of you if i could accurately say, based on the flavour of the ale, from which distillery they hail? Sadly, I cannot.) What we do know is that the whisky they held was aged for 18 years, and that that their effect is miles better than was that of last year’s barrels. In place of last year’s butterscotch nose, we have something significantly more attractive and complex, mixing soft vanilla notes with stewed fruit, light herbaceous notes and I think just a hint of peatiness. The body is sweet and flavourful, although perhaps a little simpler than it need be at 7.1% alcohol, beginning with some caramelly and chocolaty notes, backed by candied apricot, and leading in to a drier but still sweet body of lightly spicy toffee with vanilla and cinnamon notes, some lingering fruitiness and a warming quality leading into and through the finish. A bit of hoppy dryness eliminates the cloying factor that might otherwise appear at the end of such a beer and makes this, when enjoyed at slightly below cellar temperature, one of I&G’s success stories. To mark a Celtic connection, I might enjoy this with an Irish stew, but for a pure play beer and food pairing I’d probably opt more for a glazed ham or roasted game bird. 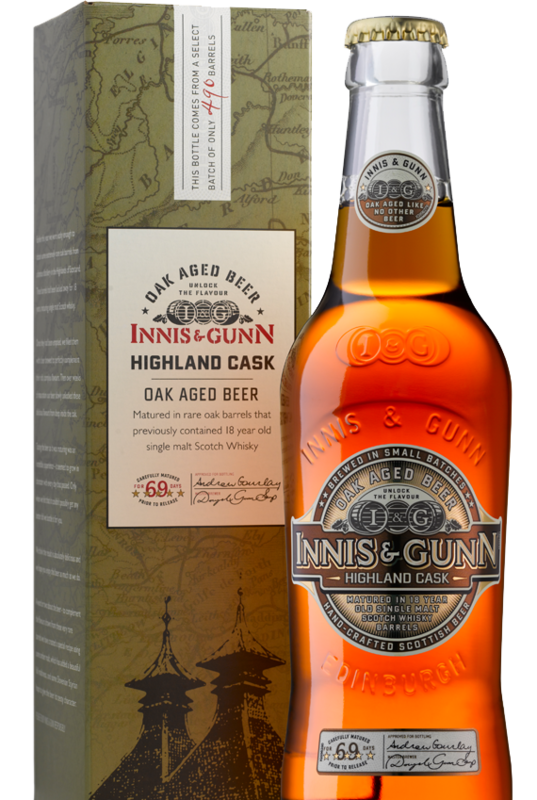 Did the I&G folks offer up any word as to availability of their 2011 Highland Cask in Ontario? I&G products are only available through the LCBO and in calling them today, it appears as though they are not planning to stock it over the holidays. If you have any insight, it would be welcomed. According to the brewery’s local market rep, Paul, the Highland Cask is at the LCBO now and should be on store shelves within two weeks.